I drive by this store in Tuscumbia, Alabama, at least twice a day. It’s a discount/closeout/salvage type of retailer that has all sorts of bargains to browse through. 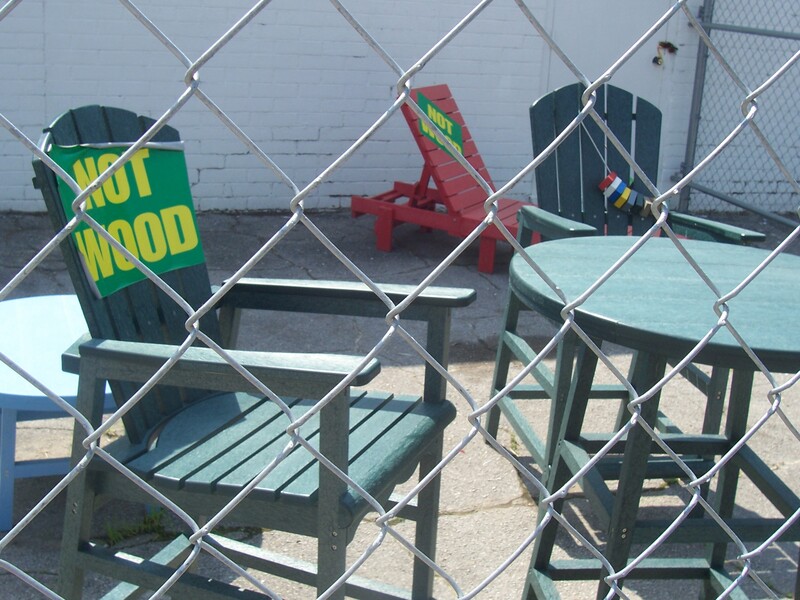 Plus, since it’s gotten warmer, the owners have put this patio furniture outside in an fenced-in area right beside the highway. For weeks as I’ve driven past, I’ve glanced over and thought to myself, “Oh, that’s so nice that they’ve put signs on their furniture warning folks that it’s ‘hot wood’ so they don’t touch it or sit down and maybe hurt themselves.” Yeah, I know, I know — but how else to explain signs that say “Hot Wood”? I suddenly one day realized, of course, that the signs actually say “Not Wood” instead of “Hot Wood” and are advertising furniture made out of sturdy wood-like plastic. Sort of reminds me of the sign in Huntsville, Alabama, that I mistook for a neighborly invitation to “Drink Locally” when I was really being asked to “Bank Locally” — although I’m a big fan of both. But surely your first thought when you saw the furniture photo was “Hot,” too. Right? Please??? A little help here??? And in more drive-by double-takes, my Dear Husband was the one who first spotted this John Deere tractor parked in the car lot of a dealership in Muscle Shoals, Alabama. “You’ve got to go take a picture of it,” he said. “I’ve never seen a tractor for sale at a car dealership.” So I checked it out, and he was right: The sight of a farm tractor parked in the midst of mini-vans for sale is a bit jarring. I mean, did somebody trade the tractor for a car? Would people wandering through the lot looking at the latest sedan models suddenly decide they wanted a tractor instead? Or maybe are tractors now the new family vehicle and we’re at the beginning of a surprising new trend? I’ll keep you posted. In any case, I love living someplace where cars and tractors happily co-exist. This entry was posted in Alabama, home, shopping and tagged Alabama, decor, farming, farms, home, John Deere, outdoor furniture, shopping, tractors by Coffee with Cathy. Bookmark the permalink. I told one of my co-workers about the tractor as he was looking for one and he said a auto dealer in Florence has one on the lot also. I’ll have to confess, I’ve driven by the discount store twice this week and thought it said Not Wood also. Sarah — That sounds like the guy who decided to do everything that ads told him to do, like drink this or eat that or wear whatever. I swear I read that story somewhere, sometime. Surely I did not make that up. I just went by on the way to a board meeting at Hope Haven. It does say Not Wood.